Preheat oven to 180°C (350°F). Heat the oil in a large, heavy-based ovenproof shallow saucepan over high heat. Cook the lamb, turning occasionally, for 6–8 minutes or until dark golden brown. Remove and set aside. Add the onion and garlic to the pan and cook for 4–5 minutes or until soft and golden. Add the thyme, rosemary, bay leaves and wine and cook for 2 minutes or until reduced. Add the tomato, stock and sugar. Stir to combine and bring to a simmer. Return the lamb to the pan, cover with a lid and cook in the oven, turning halfway, for 1½ hours. Remove the lid and cook, uncovered, for a further 20 minutes or until golden. 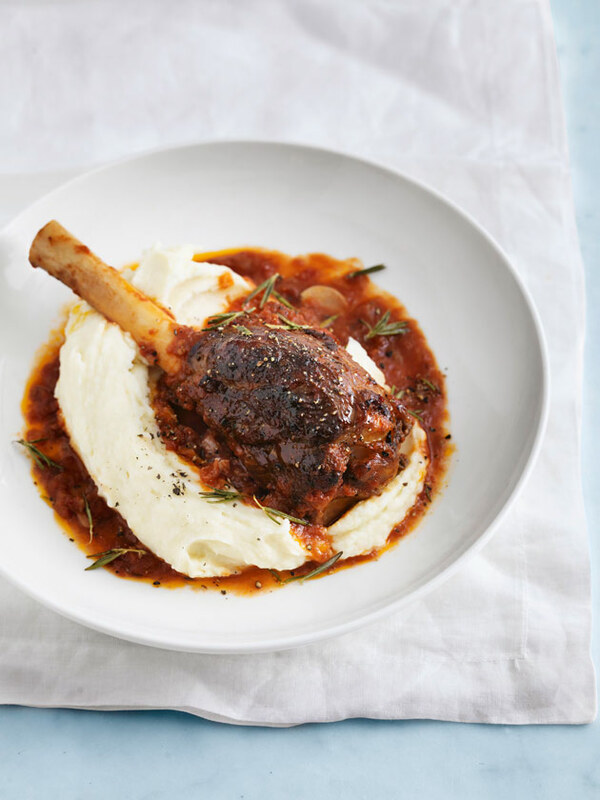 Divide the lamb and mashed potato (if using) between plates to serve. Serves 4. + To make a lamb ragu pasta, remove the meat from the bone and shred with two forks. Toss through the sauce and serve with your favourite pasta. + This recipe can be made up to two days in advance. Reheat over low heat before serving.